This article is about the consolidated city-county government entity. For the City of Honolulu, see Honolulu. For other uses, see Honolulu (disambiguation). Downtown Honolulu, the city and county urban center. Honolulu County (officially known as the City and County of Honolulu, formerly Oahu County) is a consolidated city–county in the U.S. state of Hawaii. The city–county includes both the city of Honolulu (the state's capital and largest city) and the rest of the island of Oʻahu, as well as several minor outlying islands, including all of the Northwestern Hawaiian Islands (islands beyond Niihau) except Midway Atoll. The consolidated city-county was established in the city charter adopted in 1907 and accepted by the Legislature of the Territory of Hawaiʻi. As a municipal corporation and jurisdiction it manages aspects of government traditionally exercised by both municipalities and counties in the rest of the United States. As of the 2010 census, the population was 953,207. Because of Hawaii's municipal structure, the United States Census Bureau divides Honolulu County into several census-designated places for statistical purposes. The mayor of Honolulu County is Kirk Caldwell, who in 2013 reclaimed the job from Peter Carlisle, who had defeated him in a 2010 special election. The county motto is "Haʻaheo No ʻO Honolulu (Honolulu Pride)". About 70% of the state's population lives in Honolulu County. Only Nevada has a higher percentage of its population living in its most populous county. According to the U.S. Census Bureau, the county has a total area of 2,128 square miles (5,510 km2), of which 601 square miles (1,560 km2) is land and 1,527 square miles (3,950 km2) (71.8%) is water. However, the majority of this area is the Pacific Ocean that surrounds the islands. Originally governed by a Board of Supervisors, the Honolulu County is administered under a mayor-council system of governance overseeing all municipal services: civil defense, emergency medical, fire, parks and recreation, police, sanitation, streets, and water, among others. For 2013, the county has an annual operating budget of US$2.16 billion. The government of Honolulu County is simplified and streamlined and coalesces at three major divisions of municipal power. The mayor of Honolulu is the principal executor of administrative authority. The mayor is elected on a non-partisan basis to a four-year term. The Honolulu City Council is the unicameral legislative body. Its elected members are responsible for drafting and passing laws, as well as proposing budgets for various departments. Unlike other cities in the United States, the council is absolutely independent of the mayor, who does not make any appearances during any of the council sessions. The nine council members each represent one of nine districts, and are elected on a non-partisan basis to staggered four-year terms. The Prosecuting Attorney of Honolulu is independently elected of the other two major divisions of municipal power, and is charged with prosecuting criminal offenses committed within the county. The office is not charged with providing legal counsel to the mayor or City Council; that duty is a responsibility of the Department of Corporation Counsel, under mayoral jurisdiction. The prosecuting attorney is elected on a non-partisan basis to a four-year term. The Honolulu County is divided into 36 neighborhood boards. The office of neighborhood board member is an advisory position for public policy and civil investment. Members are elected to two-year terms. Honolulu Hale is the county seat, home of the County mayor and council. Honolulu County is divided into smaller administrative districts. There are nine such districts, each of which elects a member of the city-county council. The boundaries of each district are revised every ten years in conjunction with the U.S. Census. DISTRICT I: ʻEwa, ʻEwa Beach, Honouliuli, West Loch, Kapolei, Makakilo, Kalaeloa, Honokai Hale and Nanakai Gardens, Ko Olina, Nānākuli, Waiʻanae, Mākaha, Keaʻau, Mākua. DISTRICT II: Mililani Mauka, Wahiawā, Whitmore Village, Mokulēʻia, Waialua, Haleʻiwa, Waimea, Pūpūkea, Sunset Beach, Kahuku, Lāʻie, Hauʻula, Punaluʻu, Kahana Bay, Kaʻaʻawa, Kualoa, Waiāhole, Kahaluʻu, ʻĀhuimanu, Heʻeia. DISTRICT III: Waimānalo, Kailua, Kāneʻohe. DISTRICT IV: Hawaiʻi Kai, Kuliʻouʻou, Niu Valley, ʻĀina Haina, Wailupe, Waiʻalae-Iki, Kalani Valley, Kāhala, Wilhelmina Rise, a portion of Kapahulu, a portion of Kaimukī, Diamond Head, Waikīkī, Ala Moana. DISTRICT V: Kapahulu, Kaimukī, Pālolo Valley, St. Louis Heights, Mānoa, Mōʻiliʻili, McCully, Kakaʻako, Ala Moana, Makiki. DISTRICT VI: Makiki, downtown Honolulu, Punchbowl, Liliha, Pauoa Valley, Nuʻuanu, ʻĀlewa Heights, Papakōlea, Kalihi Valley, Kalihi. DISTRICT VII: Kalihi, Kapālama (aka Pālama), Iwilei, Sand Island, Māpunapuna, Airport, Hickam, Pearl Harbor, Ford Island, Āliamanu, Salt Lake, Foster Village, Aloha Stadium, Hālawa Valley Estates. DISTRICT VIII: Fort Shafter, Moanalua, Hālawa, ʻAiea, Pearl City, Seaview, Crestview. DISTRICT IX: Waikele, Waipahu, Village Park, Kunia, Mililani, Waipiʻo Gentry. The civic center is coextensive with what is known as the Capitol District in downtown Honolulu. The official seat of governance for the Honolulu County is located within the district at Honolulu Hale, established in the 1920s as a city hall structure and houses the chambers of the mayor of Honolulu and the Honolulu City Council. In the 1960s and 1970s, Mayor Frank Fasi developed the modern civic center as it is known today. He took controversial and aggressive measures to reclaim property, demolish massive concrete structures in the area, construct underground parking facilities and open a green campus above ground with manicured lawns and specially commissioned sculpted artwork. He also oversaw the construction of new government buildings, to house the departments that fell within mayoral jurisdiction. The most prominent of those new buildings were the Honolulu Municipal Building and Hale Makaʻi, the headquarters of the Honolulu Police Department. Civic centers were also constructed off the Capitol District campus, including the Kapiʻolani Bandstand, Neal S. Blaisdell Center, and the Waikīkī Shell. The Honolulu County collects various forms of taxes, including a property tax. Revenue from those taxes is used to provide several services for the residents. The Liquor Commission regulates intoxicating liquors. The Hawaii Department of Public Safety operates three prisons, including the Halawa Correctional Facility, the Waiawa Correctional Facility, and the Women's Community Correctional Center, on the island of Oahu in the City and County of Honolulu. In addition the Oahu Community Correctional Center, the jail on Oahu Island, is in the County. The United States Postal Service operates post offices in Honolulu County. The main one is located by the Honolulu International Airport at 3600 Aolele Street. Federal Detention Center, Honolulu, operated by the Federal Bureau of Prisons, is in the CDP. The Federal Bureau of Investigation (FBI) Honolulu field office is in Kapolei. The Kunia Regional SIGINT Operations Center of the National Security Agency (NSA) and the Wheeler Army Airfield are in Honolulu County. In the census of 2000, there were 286,450 households out of which 31.8% had children under the age of 18 living with them, 54.5% were married couples living together, 12.3% had a female householder with no husband present, and 28.2% were non-families. 21.6% of all households were made up of individuals and 7.0% had someone living alone who was 65 years of age or older. The average household size was 2.95 and the average family size was 3.46. In the county, the population was spread out with 23.80% under the age of 18, 10.1% from 18 to 24, 30.6% from 25 to 44, 22.0% from 45 to 64, and 13.4% who were 65 years of age or older. The median age was 36 years. For every 100 females, there were 101.1 males. For every 100 females age 18 and over, there were 99.7 males. The United States Office of Management and Budget has designated Honolulu County as the Urban Honolulu, HI Metropolitan Statistical Area. The United States Census Bureau ranked the Urban Honolulu, HI Metropolitan Statistical Area as the 54th most populous metropolitan statistical area and the 61st most populous primary statistical area of the United States as of July 1, 2012. Hawaiian Airlines, Island Air, and Aloha Air Cargo are headquartered in the CDP. Prior to its dissolution, Aloha Airlines was headquartered in the CDP. Other major companies headquartered in Honolulu CDP include First Hawaiian Bank, Bank of Hawaii, and the Hawaiian Electric Company (HECO). Several countries have diplomatic facilities in Honolulu County. The Consulate-General of Japan in Honolulu is located at 1742 Nuuanu Avenue. The Consulate-General of South Korea in Honolulu is located at 2756 Pali Highway. The Consulate-General of the Philippines in Honolulu is located at 2433 Pali Highway. The Consulate-General of the Federated States of Micronesia in Honolulu is located in Suite 908 at 3049 Ualena Street. The Consulate-General of Australia in Honolulu is located in the penthouse of 1000 Bishop Street. The Consulate-General of the Marshall Islands is located in Suite 301 at 1888 Lusitana Street. The Consulate of the Republic of Kiribati is located at 95 Nakolo Place, Room 265. 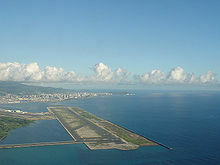 Located on the western end of the Honolulu census-designated place, Honolulu International Airport (HNL) is the principal aviation gateway to the state of Hawaii. 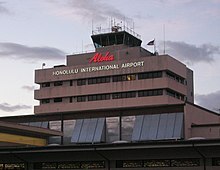 Numerous airlines fly Pacific-wide to and from Honolulu International Airport. Locally based Hawaiian Airlines also operates flights to destinations within the islands of Hawaii and to major destinations across the Pacific. Established by former Mayor Frank F. Fasi, Honolulu's public transit system has been twice honored by the American Public Transportation Association bestowing the title of "America's Best Transit System" for 1994–1995 and 2000–2001. Oahu Transit Services' "TheBus" operates 107 routes with a fleet of 525 buses. In 2004, construction had started on a bus rapid transit (BRT) system using dedicated rights-of-way for buses. The system, proposed by then Mayor Jeremy Harris, was expected to link the Iwilei neighborhood with Waikiki. However, former Mayor Mufi Hannemann largely dismantled the BRT system and deployed its buses along other express bus routes. Most buses in TheBus roster were manufactured by Gillig Corporation of Hayward, California, with the exception of articulated buses made by New Flyer, the latter also providing standard buses, likewise from Nova Bus. Currently, there is no urban rail transit system in Honolulu, although electric street railways were used during the early days of Honolulu's history. The last major attempt was called the Honolulu Area Rail Rapid Transit project, popularly known as HART. Proposed in 1968 by Mayor Neal S. Blaisdell and supported by his successor, Frank Fasi, HART was originally envisioned as a 29-mile (47 km) line from Pearl City to Hawaii Kai. By 1980, however, the project's length was cut to an 8-mile (13 km) segment between the University of Hawaii at Manoa and Honolulu International Airport. In the wake of proposed budget cuts by President Ronald Reagan, including the elimination of all funding for transit projects by 1985, newly elected Mayor Eileen Anderson cancelled the project in 1981 and returned grants and funding to their sources, arguing the project would break her vow of fiscal responsibility. Several attempts had been made since Anderson's cancellation of HART to construct a fixed rail mass transit system. All attempts stalled in Honolulu City Council hearings until in 2004, the city, county and state approved development of an action plan for a system to be built in several phases. The initial line proposed linking Kapolei in West Oahu to the University of Hawaii at Manoa. However, on December 22, 2006 the city council approved a fixed-guideway system meant to accommodate either rail or buses, running from Kapolei in West Oahu to Ala Moana, with spurs into Waikiki and Manoa. On November 4, 2008 50.6% (156,151) of Honolulu County voted to approve a new $4.5 billion rail project that would connect West Oahu with downtown, Waikiki and University of Hawaii. The trains are planned to be approximately 200 feet (61 m) long, electric, steel wheel to steel rail technology and will capable of carrying more than 300 passengers each. The rail project is currently projected to cost $5.27B. After early delays and postponed dates from not receiving a final approval from then-Governor Linda Lingle to issues involving burial sites, a ground-breaking ceremony to signal the beginning of construction was held on February 22, 2011. Despite the go-ahead, there were still other legal hurdles as the argument over burial sites continued to be a major issue that lead to court order in 2012 to have construction temporary halted. The project itself was once again a political issue in the 2012 mayoral race with former governor Ben Cayetano entering the race in the hopes of killing the project altogether, while then-mayor Carlisle and his predecessor Caldwell both wanted the project to continue. This would result in Carlisle coming in third in the August 2012 primary and leading to a run-off between Cayetano and Caldwell in the November 2012 general election, with Caldwell defeating Cayetano with the support of groups and the public who wanted the rail project to continue. In December 2012, a court order allowed the rail project to resume in all but the one of the two phases so more burial sites could be uncovered. Colleges and universities in Honolulu County include The University of Hawaii System, consisting of University of Hawaii at Manoa, Honolulu Community College and Kapiolani Community College in the Honolulu CDP, Leeward Community College in Pearl City, University of Hawaii-West Oahu in Kapolei, and Windward Community College in Kaneohe. UH Manoa houses the main offices of the University of Hawaii System. New Hope Christian College The private institutions serving the county include Chaminade University, Hawaii Pacific University, and Remington College (Honolulu Campus) in the Honolulu CDP and Brigham Young University–Hawaii in Laie CDP. Hawaii Department of Education operates public schools in Honolulu. Hawaii State Public Library System operates public libraries. The Hawaii State Library in the Honolulu CDP serves as the main library of the system, while the Library for the Blind and Physically Handicapped, also in the CDP, serves handicapped and blind people. In addition the system operates 22 branch libraries throughout the county. With symbolic native-styled architectural features, the First Hawaiian Center is the tallest building in Hawaii and home to a Honolulu Museum of Art Spalding House gallery. Established in 1900, the Honolulu Symphony is the oldest US symphony orchestra west of the Rocky Mountains. Other classical music ensembles include the Hawaii Opera Theatre. Honolulu is also a center for Hawaiian music. The main music venues include the Neal Blaisdell Center Concert Hall, the Waikiki Shell, and the Hawaii Theatre. There are various institutions supported by the state and private entities for the advancement of the visual arts. The Honolulu Museum of Art is endowed with the largest collection of Asian and Western art in Hawaii. It also has the largest collection of Islamic art, housed at the Shangri La estate. Since the merger of the Honolulu Academy of Arts and The Contemporary Museum, Honolulu (now called the Honolulu Museum of Art Spalding House) in 2011, the museum is also the only contemporary art museum in the state. The contemporary collections are housed at main campus (Spalding House) in Makiki and a multi-level gallery in downtown Honolulu at the First Hawaiian Center. The museum hosts a film and video program dedicated to arthouse and world cinema in the museum's Doris Duke Theatre, named for the academy's historic patroness Doris Duke. The Hawaii State Art Museum is also located in downtown Honolulu at No. 1 Capitol District Building and boasts a collection of art pieces created by local artists as well as traditional Hawaiian art. The museum is administered by the Hawaii State Foundation on Culture and the Arts. Recognized internationally as the premier cultural institution of Hawaii, the Bishop Museum is the largest of Honolulu's museums. It is endowed with the state's largest collection of natural history specimens and the world's largest collection of Hawaiiana and Pacific culture artifacts. The Honolulu Zoo is the main zoological institution in Hawaii while the Waikiki Aquarium is a working marine biology laboratory. The Waikiki Aquarium is partnered with the University of Hawaii and other universities worldwide. Established for appreciation and botany, Honolulu is home to several gardens: Foster Botanical Garden, Liliuokalani Botanical Garden, Walker Estate, among others. The Honolulu Triathlon is an Olympic distance triathlon event governed by USA Triathlon. Held annually in May since 2004, there is an absence of a sprint course. Honolulu County is home to numerous forms media including newspapers, magazines, radio and television. ^ "Events, Official Web Site for The City and County of Honolulu[permanent dead link]." City and County of Honolulu. Retrieved October 14, 2008. ^ a b c "About the City and County of Honolulu". City and County of Honolulu. Archived from the original (Government website) on October 12, 2004. Retrieved August 2, 2013. ^ "Council Members". Honolulu City Council. City & County of Honolulu. Retrieved 22 February 2018. ^ a b "State & County QuickFacts". United States Census Bureau. Archived from the original on July 11, 2011. Retrieved June 28, 2014. ^ "Cities with 100,000 or More Population in 2000 ranked by Population per Square Mile, 2000 in Alphabetic Order". United States Census Bureau, Population Division. 2008-07-10. Archived from the original on 2002-12-26. Retrieved July 13, 2008. ^ Grube, Nick (June 21, 2013). "Caldwell: Brace for Cuts in Honolulu City Services". Honolulu Civil Beat. Peer News. Retrieved October 20, 2013. ^ "Department of the Prosecuting Attorney: Welcome". HonoluluProsecutor.com. 2013. Archived from the original on September 25, 2013. Retrieved October 20, 2013. ^ "Department of the Corporation Counsel". Honolulu.gov. September 24, 2013. Archived from the original on October 21, 2013. Retrieved October 20, 2013. ^ "Department of the Prosecuting Attorney: About". HonoluluProsecutor.com. 2013. Archived from the original on September 25, 2013. Retrieved October 20, 2013. ^ "Prisons." Hawaii Department of Public Safety. Retrieved May 19, 2010. ^ "Institutions Division." Hawaii Department of Public Safety. Retrieved May 19, 2010. ^ "Oahu Community Correctional Center." Hawaii Department of Public Safety. Retrieved May 19, 2010. ^ "Post Office Location - HONOLULU." United States Postal Service. Retrieved May 21, 2009. ^ "FDC Honolulu Contact Information." Federal Bureau of Prisons. Retrieved December 30, 2009. ^ "Honolulu Division." Federal Bureau of Investigation. Retrieved on June 9, 2015. "91-1300 Enterprise Street Kapolei, HI 96707"
^ "U.S. Decennial Census". United States Census Bureau. Archived from the original on May 12, 2015. Retrieved June 28, 2014. ^ "Historical Census Browser". University of Virginia Library. Retrieved June 28, 2014. ^ "Population of Counties by Decennial Census: 1900 to 1990". United States Census Bureau. Retrieved June 28, 2014. ^ "Census 2000 PHC-T-4. Ranking Tables for Counties: 1990 and 2000" (PDF). United States Census Bureau. Retrieved June 28, 2014. ^ "Table 1. Annual Estimates of the Population of Metropolitan and Micropolitan Statistical Areas: April 1, 2010 to July 1, 2012". 2012 Population Estimates. United States Census Bureau, Population Division. March 2013. Archived from the original (CSV) on 2013-04-01. Retrieved March 20, 2013. ^ "Corporate Headquarters." Hawaiian Airlines. Retrieved May 20, 2009. ^ "Contact Information Archived June 5, 2009, at the Wayback Machine." Island Air. Retrieved May 20, 2009. ^ "Locations Archived May 22, 2009, at the Wayback Machine." Aloha Air Cargo. Retrieved May 21, 2009. ^ a b "Honolulu CDP, HI Archived February 18, 2008, at the Wayback Machine." U.S. Census Bureau. Retrieved May 21, 2009. ^ "Aloha Airlines, Inc." BusinessWeek. Retrieved May 21, 2009. ^ "Visa & Travel Archived November 3, 2008, at the Wayback Machine." Consulate-General of Japan in Honolulu. Retrieved August 17, 2008. ^ "Location Archived December 11, 2008, at the Wayback Machine." Consulate-General of South Korea in Honolulu. Retrieved January 10, 2009. ^ "Other Philippine Missions in the U.S.." Consulate-General of the Philippines in Chicago. Retrieved January 10, 2009. ^ "Department of Foreign Affairs, Overseas Embassies, Consulates, and Missions." Department of Foreign Affairs (Federated States of Micronesia). Retrieved January 10, 2009. ^ "Australian Consulate-General in Honolulu, United States of America." Department of Foreign Affairs and Trade. Retrieved January 10, 2009. ^ "Foreign Mission Archived June 25, 2011, at the Wayback Machine." Republic of the Marshall Islands. Retrieved January 28, 2009. ^ William D. Middleton (November 1990). "Honolulu: trains at last?". Railway Age. Retrieved January 19, 2008. ^ William D. Middleton; Turner, Wallace (June 28, 1981). "Honolulu's mayor ends proposal for rail line in downtown area". New York Times. Retrieved January 20, 2008. ^ Leavitt, Judith A. (1985). American Women Managers and Administrators. Greenwood Press. pp. 8–9. ISBN 0-313-23748-4. ^ Pang, Gordon Y.K. (December 16, 1998). "Will rail fly this time?". Honolulu Star-Bulletin. Retrieved October 12, 2008. ^ "Honolulu rail project passes". khnl.com. Archived from the original on 2012-09-05. ^ "Article about Monsanto was 'right thing to do'". honoluluadvertiser.com. December 26, 2015. ^ Rail costs low-balled, consultant says Hawaii News, Honolulu, Honolulu News, Sports, Editorial, Features, Travel and Business - Honolulu Star-Advertiser - Hawaii Newspaper. Staradvertiser.com. Retrieved September 6, 2013. ^ Schwind, Paul. "Honolulu Rail Remedy - Phasers On Minimal". Web. Hawaii Reporter. Retrieved January 17, 2013. ^ Magin, Janis L. "Land deals could breathe new life into Moiliili." Pacific Business News. Sunday July 1, 2007. 1. Retrieved October 5, 2011. "Dobelle at that time had even suggested moving the University of Hawaii system offices from the Manoa campus to office space in Moiliili, something the current administration is not actively considering." ^ "Hawaii State Library Archived April 13, 2009, at the Wayback Machine." Hawaii State Public Library System. Retrieved May 22, 2009. ^ "Library for the Blind and Physically Handicapped Archived May 28, 2009, at the Wayback Machine." Hawaii State Public Library System. Retrieved May 22, 2009. ^ "Library Locations Archived May 13, 2009, at the Wayback Machine." Hawaii State Public Library System. Retrieved May 22, 2009. ^ Hoover, Will (May 25, 2009). "Hawaii's Bishop Museum struggles to survive recession". Honolulu Advertiser. Retrieved October 20, 2013. ^ "Bishop Museum: About Us". BishopMuseum.org. Archived from the original on October 24, 2013. Retrieved October 20, 2013. ^ City and County of Honolulu: Sister Cities[permanent dead link], Honolulu, 2008. Retrieved February 8, 2009. ^ "05/11/15 Honolulu and Candon City become Sister-Cities". www.honolulu.gov. Wikivoyage has a travel guide for Honolulu. This page was last edited on 14 April 2019, at 21:12 (UTC).